EF4738E Fire/Water Digital Safe is rated 4.2 out of 5 by 19. There are some things that just can't be replaced. The Executive Digital Safe EF4738E offers ETL Verified water resistant for 12" of water for 72 hours for your important records and cherished belongings. The EF4738E also offers multi-position interior shelves to keep your important items organized. Rated 4 out of 5 by MDC1954 from Well built for the most part. Overall well built but one improvement would give it five stars. I bolted it directly to a flat concrete floor but it wobbled. I thought the floor may have had a high spot but did not. Looking down into the bolt hole cavities after re- bolting, the problem was revealed. The bolts were tight. It was the bottom of the save flexing that was causing the wobbling. The bottom of the safe either needs to be made of a thicker gauge of steel or beefed up to prevent wobbling. Rated 3 out of 5 by Mr Harpo from Budget and Size Good sized safe for a decent prize. Quality of internal vertical shelve bracket placement is poor and cheap feel quality shelves. Other than that over all good safe, you do need to account for the door swing thickness (door thickness and handle) when thinking about placement. Rated 5 out of 5 by Rich Fiorenza from Reliable Support This is my third purchase of a SentrySafe product. My primary reason for continuing with SentrySafe is the excellent support and assistance I received when problems with the internal mechanism of my prior one. I am still using it in addition to the current one purchased. Rated 4 out of 5 by moros323 from Good size and easy setup. I do like the safe I have an issue with the industrial oil smell that it has at this time as I bought this to store plant based medicine and the smell could ruin my meds. I also had an issue with the door not locking removed the inner panel and discovered a bent piece, bent it back and works fine now. I do like it but something needs to be done about the smell. Rated 2 out of 5 by Greg 8822 from Disappointed in quality I've owned this safe for a few years and was happy. Then wear and tear of opening and closing the safe (twice a month on average) caused the internal lock mechanism to fail. The angle iron used appears to be 1/8" thick which allowed for too much flex and the pin that should be in the horizontal angle iron popped out allowing the upper piston to fall down into the door. Why isn't there a carter pin or some other form of pin to lock that pin in place? I was lucky enough the first time to be able to pull the cover off and repair. The second the time the door was locked shut and I had to break into the safe to open. Their customer service department was very helpful and courteous on the phone. But, from my standpoint I haven't used the safe enough to have these kinds of issues. It's disappointing because everything else about the safe was great. My question is why would I want to buy another one when I know it will eventually fail again? 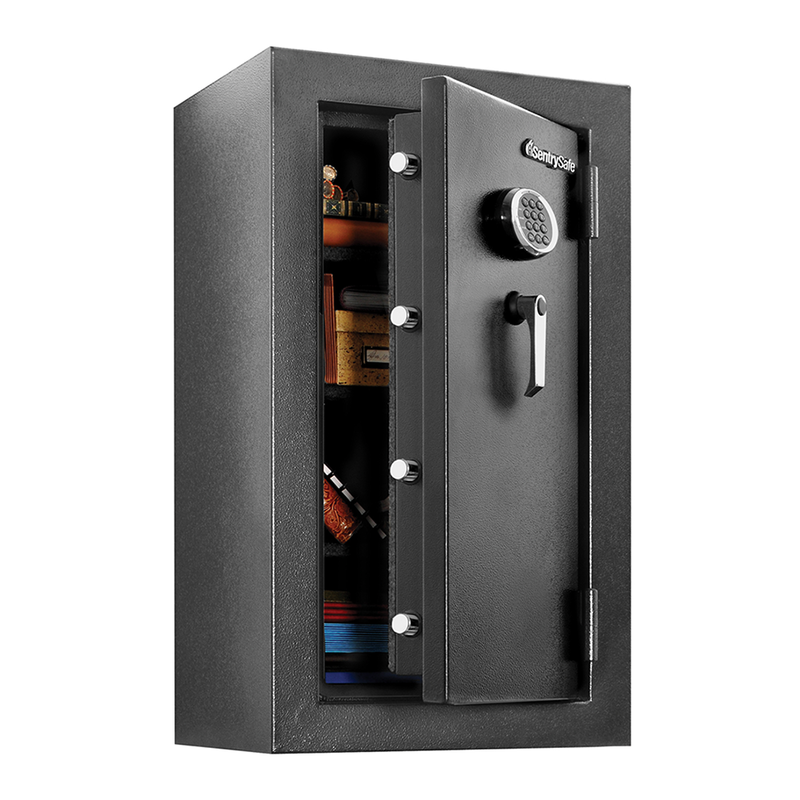 Rated 4 out of 5 by DCoop from Great size and has the needed safety I was looking for a safe that had the needed size for binders of important data and documents as well as valuable personal items and the ability to safely store handguns when away, this is it. Arrived is great condition. Programming access code was easy. Was surprised in just how easy it is to move this safe even with its weight. Will not bolt down due to loss of water tight integrity but am looking at a strap down system that will accomplish the same thing. The shelves are easy to adjust. Depending on location, you may want to keep a flashlight inside or put in a battery op LED light, it's dark inside and depending on what you're storing it will be easier to find. We have had two very close calls with hurricanes in the last two years and wanted peace of mind for any possible flooding as well as fire protection. I did find the keypad to be much cheaper made plastic than I expected and hope the durability is better than it appears on that part - does not seem consistent with the quality construction of the rest of the safe.